This article is a breakdown of the tour operator settings that are in the system. The reason you would use a Tour Operator is when you will give a commission to a third party agent. You would first need to enable the Tour Operator module first, to learn how to, click on this link here. Firstly, there are 13 settings in total that are available for the tour operator. 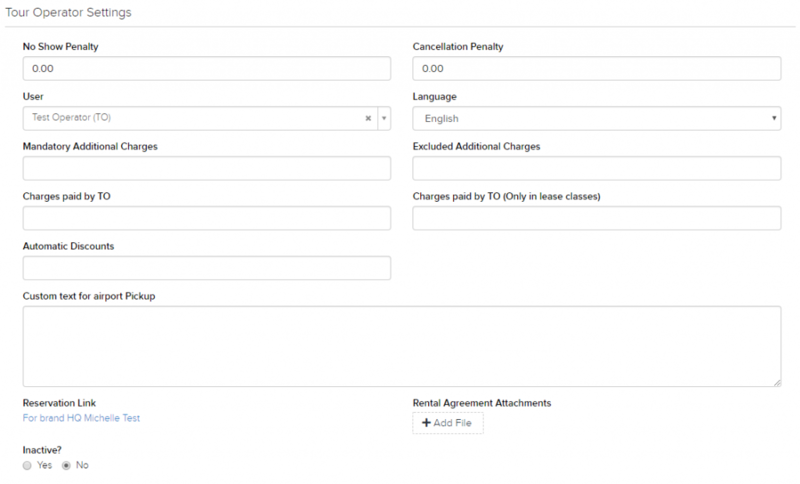 These are “No Show Penalty”, “Cancellation Penalty”, “Language”, “Mandatory Additional Charges”, “Excluded Additional Charges”, “Charges paid by TO”, “Charges paid by TO (Only in lease classes)”, “Automatic Discounts”, “Custom text for airport Pickup”, “Reservation Link”, “Rental Agreement Attachments”, and lastly “Inactive?”. You will use this penalty when a customer that booked with the tour operator did not show. The amount that you put here will be subtracted from the total summary of the commission that you will have to pay to the tour operator. This is similar to the No Show Penalty. The only difference is that this is for customers who canceled the booking. This sets the language for the tour operator. Do note that the language set here is the language of the email that the system will send to the Tour Operator. This will set the additional charges that will be mandatory for the customer under the Tour Operator. This will exclude the additional charges that will be for the customer under the Tour Operator. The options selected here will not be available for the Tour Operator on Step 3 (Extras). This will set the additional charges that the Tour Operator will pay. This setting is similar to the Charges paid by TO setting. However, it will only apply for the lease class. This will automatically apply any discounts that you can create for this particular tour operator. This will set the text that you will use for pickups in the event that it is an airport pickup. This is the reservation link for iFrame that will automatically select this particular Tour Operator when doing a reservation. This will upload additional terms and conditions to the rental agreements for the Tour Operators in the event that they have their own terms and conditions. This setting will make sure that this particular Tour Operator will not be available for selection when making a reservation. Instead of the deletion option, this setting will keep all the records of the reservations that this tour operator is apart of.